The 1986 HONDA GOLDWING ASPENCADE for SALE has had the oil and filter changed every 2000 miles, the stator was replaced at 80k, fork seals at 85k and the timing belts at 70k. The paint condition of the 1986 Honda Goldwing for sale is 95% with a few small chips on the front fender. It has newer Dunlop Elite 3 motorcycle tires with good tread and I had a new battery installed this year. The features and extra accessories include a Digital dash, AM/FM cassette radio, (non-working)40 channel cb radio, travelcade road sofa, driver back rest, passenger arm rest, 3 storage pockets, running lights and extra rear lights, lighted rear bumper, ice chest holder on rear, front and back cup holders, luggage rack, front fender rail, caliper covers, custom foot rain guards, toe pegs, progressive springs in front, tall tulsa windshield, chrome radiator grill, trunk extender kit, volt meter, super brace on front forks, exhaust turndowns, an onboard air compressor, and air shocks in front and rear. 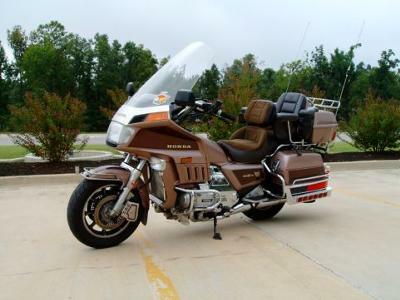 The 1986 HONDA GOLDWING ASPENCADE for SALE is road ready and has only 85000 miles on it currently. The motorcycle has never been wrecked and has not put me through any roadside breakdowns. This is overall a very reliable bike that comes with a clear title. I bought the 1986 Goldwing in 1990 and have put 80k of the 85k miles on it. I have ridden through all 48 states and through a good portion of Canada on it. I am now 71 years old and I have decided that I am going to stop riding due to my age. like to invite our visitors who are having problems with their 1986 HONDA GOLDWING ASPENCADE to leave a description of the problem that you are having to see if somebody who stops by might offer a solution or give you some advice on how to fix your motorcycle (and DON'T FORGET to leave your contact information in case they need to get in touch with you). 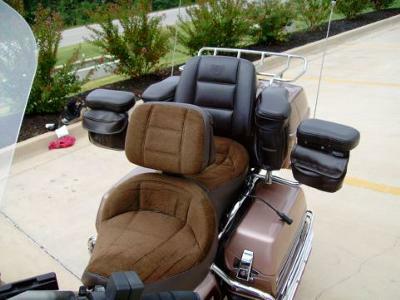 If you are having trouble finding 1986 HONDA GOLDWING ASPENCADE parts, you can post what it is that you are looking for that you need to get your bike back on the road. AND it would also be helpful if you would write a review of 1986 HONDA GOLDWING ASPENCADE to make others aware of any problems common to this model or to list its positive features, make recommendations for desirable accessories or anything else you think we should know. 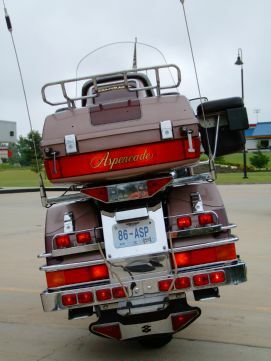 We encourage you to submit your opinions and write reviews of the 1986 HONDA GOLDWING ASPENCADE for SALE for sale if you have had experience with it, not to kill the Wing's reputation or to give it a bad user rating but to help potential buyers make informed decisions and to benefit the biker community as a whole. Qualified drivers will be allowed to test drive the motorcycle at my discretion. Gaylen Sanders via email using the comments form found at the bottom of this ad (and don't forget to mention that you found this ad on Strike Lightning's Motorcycle Classifieds gogocycles.com)! The 1986 Goldwing for sale is located in Missouri and my asking price is $4200 cash on pickup. Join in and write your own page! It's easy to do. How? Simply click here to return to HONDA GOLDWING -1986.